As well as being a quality tester it's a precision line-up tool, a stereo PPM, a balanced-unbalanced convertor (both ways),a stereo mic preamp, a headphone amp, and a level convertor. Automated measurements can be made through the use of Sequences. This powerful system allows a series of measurements to be made with the press of two buttons. The 'sequence' of tests can be run at any level and any necessary normalisation is taken care of for you. Graphs of frequency response, noise against time and level against level (headroom plot) can all be displayed by the computer support software Lin4WinXP (supplied). The Minisonic range represents a new direction for Lindos and despite tiny size and low cost it can still generate and measure to +18dBu. While the MS10 includes a form of the automated sequence testing used daily the world over by LA100 users the MS1 provides low cost entry by leaving out all segments but the five second sweep. Upgrading to an MS10 requires only the firmware chip (access via front panel). Minisonic Sequences run considerably faster because they are two channel and use an improved format so, unless you require the exceptional precision of the LA100 the MS10 may offer everything even professional users need, but at a much lower price. 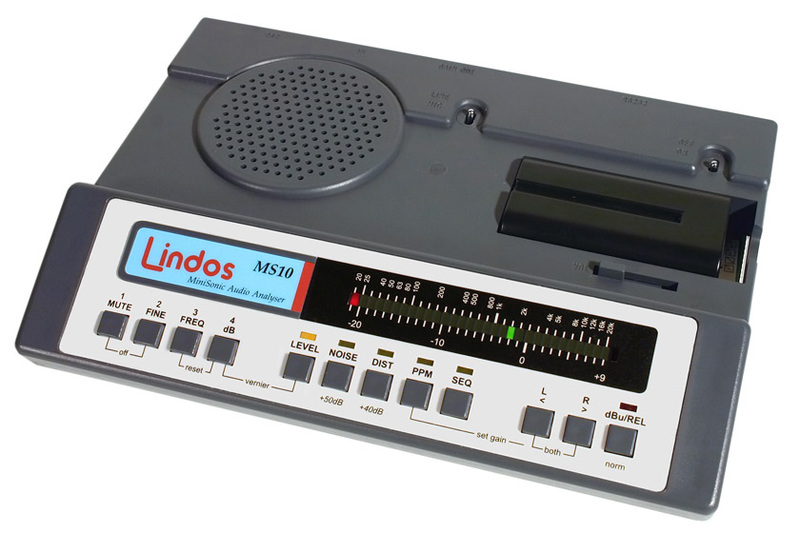 The most commonly used LA100 segments can also be generated and received by the MiniSonic. See the Version History page for full details. Low Distortion Precision Digitally Synthesised Generator 4Hz to 40kHz with -86db THD @ 1khz and 0.02dB ripple. Vernier mode using the 'shadowbar' for readings to 0.05dB resolution on the built-in LED display for critical line-ups. Noise, Crosstalk and Distortion measurement with perceptually based weighting. Sweep and Sequence Capability simultaneous two-channel sweep plus many other automatic segments (distortion, noise, sweeps, headroom plot and even PPM tone burst tests). Novel 'UniSon' Interfaces for instant compatibility with both Balanced Professional and Single-Ended Consumer levels (XLR and Phono leads supplied). Bright true - PPM Display IEC 268 type II (BBC standard) - with stereo gain controlled loop-through output - ideal for setting levels in video post production, or for field recording to camcorders. Stereo low-noise Microphone Preamps built-in, with 5V power for calibrated miniature electret microphones. Lithium-ion battery for 15hrs use, with built-in charging from a universal 12V power adaptor (included). Calibration is such that 100dB SPL reads 0dB on level +-0.5dB at 1kHz, making accurate measurements of monitor level and frequency response possible. The MiniSonics sweep segments, with automatic triggering from the sound (no other connection needed) can be used to plot frequency response or rooms, speakers and other microphones. Echoes may interfere at bigger distances. Acoustic noise levels can also be measured to low levels for comparing noise from air conditioning, computer fans etc; and of course, electret microphone noise levels can be measured directly. RS232 (9600 Baud) in and out on 9w D socket. Full set of remote commands similar to LA100 but with special commands for two-channel operation. 'SyncLink' fast auto-binary-data-out format for 110Hz computer update with 'Lin4Win' support software on PC gives true PPM two-channel dynamics without flicker, and simultaneous control from either the unit or the computer. This software provides superb enhancement of the MiniSonic facilities when used with a PC or Laptop. The full control panel, with fast updating twin precision bargraphs as well as digital display of level (to 0.01dB) and frequency displays, provides auto-ranging, manual range selection, and many other facilities not possible from the MiniSonic controls directly. Fast response has been given priority through the use of SyncLink, so that the controls have the feel of hardware rather than software. The unit can be unplugged and 'hot-plugged' with communication re-established in a second or two. Sequences can also be edited and run more easily, with stunning full graphic presentation. Sequences run from Lin4Win (as opposed to downloaded after running), can display high-resolution sweeps (up to 128 frequency steps), with two-channel results in as little as five seconds. Tone bursts, presets, unlimited sequence results storage, and graph scaling are just some of the added features available with Lin4Win.